Sal Morello has won the $600 Mega Stack Challenge event and takes home the trophy along with the first place prize of $60,202. Congratulations to Sal and join us tomorrow at 11am for the $130,000 Guaranteed $300 No-Limit Hold 'em Mega Stack Challenge. After a long heads-up battle that saw the lead go back and forth, Sal Morello had taken a chip lead on Ronnie Pease with the blinds at 40,000-80,000 and a 10,000 ante. The board ran out [Jd][8d][3s][7c][6d] and Morello's pocket tens held. Ronnie Pease was eliminated in 2nd place and takes home $34,573. The board of [Jc][5d][2h][5c][Qh] ran out safely for Pease and he eliminated Agard in 3rd place for $21,978. The board came [Js][8h][4s][8d][5d] and Pease's pocket sixes held up to eliminate Maglio in 4th place for $17,556. Ronnie Pease raised to 125,000 under the gun before the flop and was called by both Sal Morello and Vinny Maglio in the blinds. The flop came [Kc][Jh][9c], Morello checked,, Maglio checked and Pease bet out 200,000. Morello raised to 500,000, Maglio mucked and Pease called. Pease had flopped two pair to Morello's aces and the [Js] on the river gave him a full house. Pease doubled up to just over six million while Morello was knocked down to just over two million. After Vinny Maglio raised to 80,000 from under the gun, Colby Derrig moved all in for 730,000. Sal Morello announced call from the big blind and Maglio immediately moved all-in. Morello thought for a moment before mucking his hand. The board ran out [As][Ts][5s][Ks][9d] and Maglio's hand held to win the pot and eliminated Derrig in 5th place for $13,624. Darkazalli had flopped middle pair and was ahead but Morello had an open-ended straight draw. Morello completed his straight on the turn when a queen hit, leaving Darkazalli drawing dead. A meaningless king fell on the river. Adam Darkazalli was eliminated in 6th place for $10,924. The board came [Qh][6h][4s][9h][8h] and Hodlund was eliminated from the $600 Mega Stack Challenge in 7th place for $8,869. The board ran out [Jd][Th][2h][9d][Jd] and Morello's queens held. Brian Lee was eliminated in 8th place for $7,068. The board came [Th][9s][2c][2h][2s] and Maglio took the pot. Tom Pollina was eliminated in 9th place for $5,798. The board ran out [Qd][9d][5c][4c][4h] and Morello's pocket eights held up. Carlos Santos was eliminated in 10th place for $3,727. With the blinds at 12,000-24,000 with 4,000 ante, we are down to 12 players in the $600 Mega Stack Challenge. Once we reach the final 10, we will redraw for seats at the final table. The blinds are being increased to 10,000-20,000 with a 3,000 ante. With 21 players remaining, the average chip stack is now just over 595,000. The board ran out [Qc][6d][6h][8d][Js] and Ronnie Pease won the biggest pot of the tournament, eliminating Rushton on the hand. Pease now has over 2,700,000 of the 12.5 million in play with 23 players remaining. Ronnie Bardah had slowly been building his chip stack all day after coming into Day 2 with only 129,000. He was near 500,000 when he got all-in before the flop with pocket aces against his opponent's pocket queens. The flop came out J-8-5 and Bardah maintained the lead. However, a 10 came on the turn and a 9 fell on the river, giving his opponent runner-runner to a straight. Bardah's opponent had him covered and Ronnie Bardah was sent to the rail in 30th place for $1,696. Mike Rushton currently has nearly one million chips and is second to only Ronnie Pease, who has about 1.2 million. Pease just got moved to Rushton's direct left at the feature table. You can watch the live feed of the feature table by clicking "Watch LIVE Video" at the top of the page. Day 1 of the $400 No-Limit Hold 'em Bounty event now has well over 200 players registered. The blinds are currently 100-200 and all players started with 15,000 in chips. For every player you eliminate from the tournament, you earn a $100 Bounty on that player. Play has resumed on Day 2 of the $600 Mega Stack Challenge. There is 46:46 left in Level 20 (5,000-10,000 with a 1,000 ante). With 49 players remaining, the average chip stack is just over 255,000. With 51 players remaining, we had one player eliminated on two different tables on the same hand. Those two players are splitting the $1,388 prize for 50th place. Play has concluded for the night for the remaining 49 players. Play will resume tomorrow at noon. Ron Pease looks to be the chip leader at the end of Day 1 with 983,000. 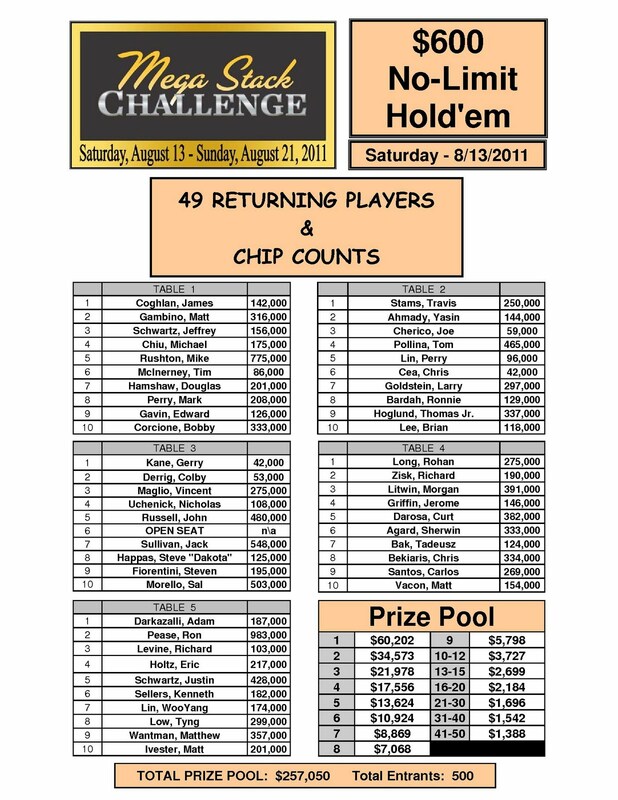 Official chip counts and Day 2 seating assignments will be posted here on FoxwoodsPoker.com as soon as they are available. With 25 minutes remaining in Level 19 (4,000-8,000 with a 1,000 ante), we are down to 55 players remaining. The top 50 will finish in the money. The average chip stack is now just over 227,000.